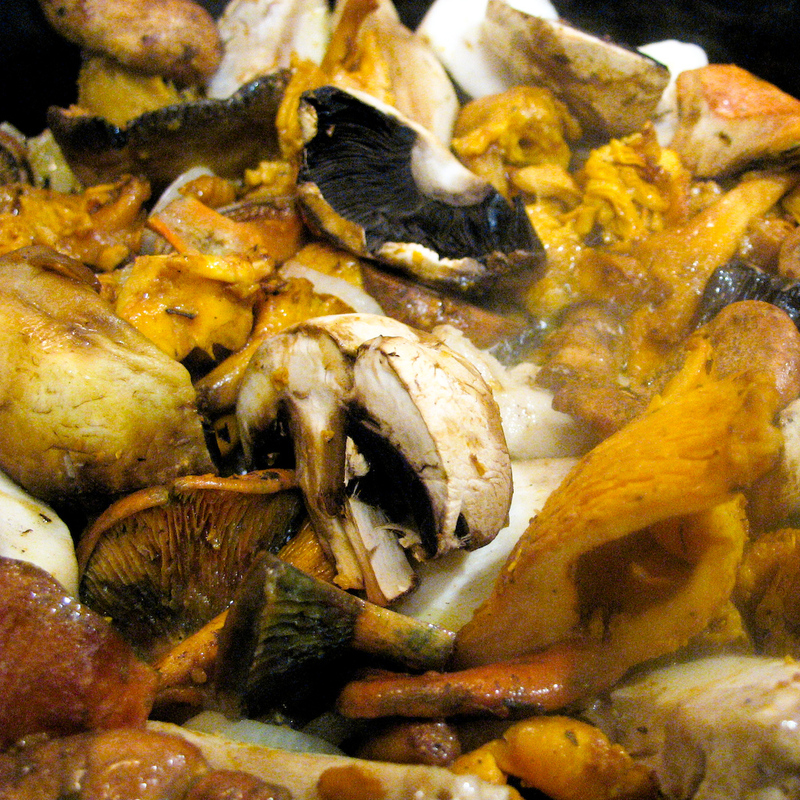 Prior to my arrival on the Peninsula, my experience with wild mushrooms were both infrequent and rather tame. Having lived in Illinois, New Mexico, Colorado and Minnesota, my knowledge of mushrooms solely consisted of cute little button white mushrooms bought in the grocery store that had a slightly sweet flavor eaten raw, and when cooked, seemed to absorb any of the stronger flavors surrounding it. However, truth be told, both Illinois and Minnesota are renowned for their wild mushrooms. 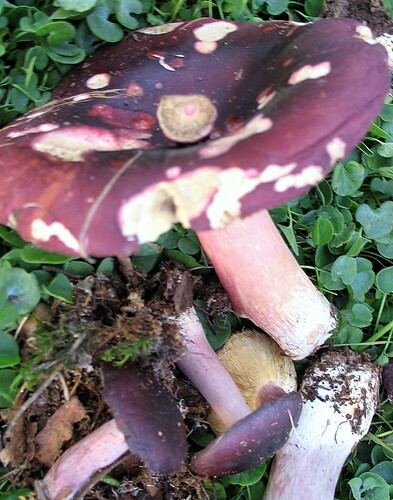 Every November, festivals are celebrated across the Midwest, with avid mushroom lovers coming in droves to hunt Sheepheads, Stumpers (or Honey Mushrooms), Goldentops, and Morel mushrooms, among many others. And although I have very fond memories of picking forest berries, my family was never keen on scavenging for fungi. Granted, my four year stint in Japanese restaurants exposed me to a wider range of exotic mushrooms including: Shitake, Maitake, Bunashimeji, Nametaki, Hiratake, and a long stringy snow white mushroom with a wee little head, Enoki, but nothing as compared to the variety you can scrounge up here in Catalunya, Spain. Come fall, as humidity sits upon our valley like a thick wet blanket, fruit stands come alive with various plastic containers filled with exotic mushrooms. Many of these mushrooms are so incredible ugly that your wondering if your local vender isn’t trying to pull over your eyes, selling you something more fitting for your compost heap than your evening meal. Tafona Negra, or the Black Trumpet, is one of the most frightening looking buggers you’ve ever laid your eyes on. Black as charcoal, with polygonal warts, grooved longitudinally, the Black Trumpet’s inside, or gleba (word of the day), is born snow white in color, and through its maturation turns a dark reddish hue and eventually, jet black. 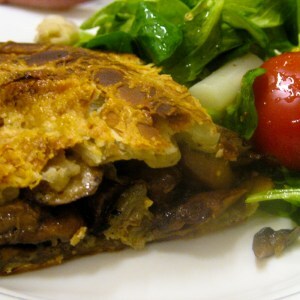 However, this is rich and aromatic mushroom needs only a small piece to infuse any dish with its flavor. Another common mushroom used in Catalan cuisines at this time of the year is the Rovella. This funky dusty reddish-orange mushroom can be identified by its small forest green stains in concentric rings that alternate from light to dark in hue. The cap is also rather unusual, as its wide and concave, as if it never fully finished its development. These are meaty and delicious mushrooms that pair well, according to my Catalan fruit vender, with the Llenega mushrooms, a fat white stemmed mushroom with a small stocky black cap. Having put both of them into a cherry tomato, spinach and red pepper risotto sprinkled with cured manchego cheese, I’d have to agree with him. It was absolutely mouth watering, but I warn you, the Llenega mushrooms were covered 4 cm thick in white mold the following day. Why? I have zero idea, but my neighbors felt I overreacted when I threw them away saying, “Gabriella, just wash it off with a little water and put them in the refrigerator to stay fresh.” With the exception of placing mushrooms in the refrigerator, Ryan agreed with their consensus, but after seeing such a dramatic change in one evening, I feared for my for my poor stomach, which is anything but ironclad. Speaking of potentially life altering mushrooms, let’s chat about mushrooms you should not eat no matter how funky and exotic they may appear to you. Although I’ve never noticed these toxic balls of fungi in the wild, I did receive a nice little lecture a few weeks ago at the “Bolets de Catalunya” festival. By chance, while walking down the Rambla Catalunya to the Boqueria Market, I passed twelve 6ft long tables in an enormous rectangle filled with mushrooms. Each mushroom sat infront of a small white sign sharing its various names in Latin, Catalan, etc; history; taxonomy; and I kid you not, level of toxicity. One skull and bones sign is enough for me to stay away for any mushroom, but 3 back to back has be running for the hills. That said, you know the classic mushroom we all drew as a kid with its big cherry red cap with small white spores on it? Yeah, don’t eat that one, because depending on the quantities, you’ll either be hallucinating for a long while, or you’ll be on your way to the hospital. 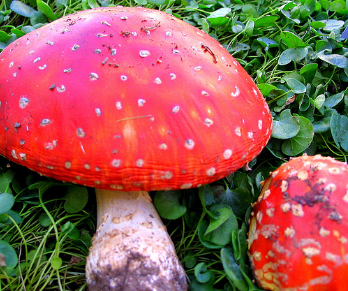 Called the Amanita muscaria, or “fly agaric”, this is not one you want to bring home and cook up for your sweetie. Nor would I attempt to eat the Ou del Diable, or Devil’s egg. From a 10-20 cm long thick white stem shoots out a medium sized teardrop head of white or gray color. Trust me, you can’t miss this mushroom, as its phallic structure and rather unappealing color doesn’t make you want to uproot it for a spontaneous picnic in the forest. So what should you take away from this? If you can plan a visit to Spain during the mushroom season, I highly suggest it. There are festivals all over Catalunya from the end of September to the beginning of November, where restaurants will even dedicate an entire meal, dessert and all, to wild mushrooms. Additionally, wines from Catalunya are a wonderful pairing with mushrooms. Whether you choose a crisp, lively Cava to a rich buttery Chardonnay, you won’t be disappointed. If you’re interested in learning more mushrooms, while picking up a few Catalan words, head over our local mushroom site. I’ll go over some of the terms listed in the header, so that you may peruse pictures at your leisure to know what is, and is not, toxic to eat in Catalunya.